I don't always feel qualified, pedigreed as it were, to talk about hip hop, as with many of these reviews, I find myself trapped in a space of philosophical appreciation that lacks the formal experience and education necessary to understand the source code for each and every song, sample and reference. So I default to how an album feels and looking at jazz and blues and the other historical starting points of American music from which hip hop et al. burst butterfly-like from a cocoon. With Big K.R.I.T. I find a lot of the strongest qualities found with Girl Talk and other mash-up aficionados as well as the smooth, pop-driven and catchy rhyming delivered by Kanye West and Outkast. On Return Of 4Eva, Big K.R.I.T. 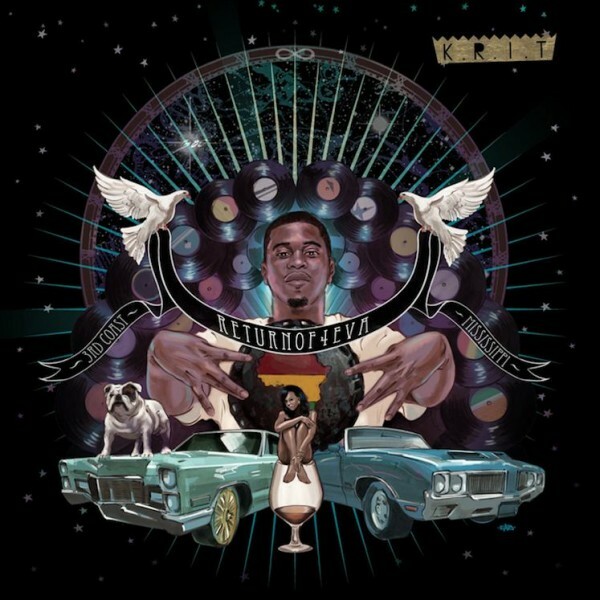 delivers a seemingly endless stream of ultimately enjoyable songs that cover a large swath of sonic territory, carefully managing solemn lines and riotous outbursts that manages to pay homage to some of rap and hip hop history (references and sampled sections abound) while also snagging classic Motown era sounds and dance riffs. What's dangerous here is also what is so excellent. Return Of 4Eva offers a little bit of everything. And even in some spots where the words aren't quite as strong as sounds backing them (occasionally the storytelling is deadpan, lacking playfulness) Big K.R.I.T. offers so much solid and digable content that it's hard to pick on any specific song. Listen to it below via the embedded DatPiff.com player. And get it free/pay for it via returnof4eva.com. The first three tracks, flowing together seamlessly, are "R4 Intro," "Rise and Shine" and "R4 Theme Song." With this swift 7+ minutes, the album is established. The music will be beat-driven but the backing samples and mixes are often simpler, instantly catchy and often recognizable. "Rise and Shine" in particular does good work to get the album rolling; it's that hook you need to really keep going and it's perfectly placed. Other tracks of note are "Rotation," which despite somewhat lazy lyrics feels sturdy and memorable. And "Sookie Now" marks an entrance to the album's wheelhouse. It's followed by "American Rapstar," a song that tells a common story of leaving the streets to become famous with the addition of finely placed, clear and noble political commentary. Other tracks of note: "Shake It," "Lions and Lambs," "Time Machine," "Players Ballad," and "Amtrak." What I seem to be rushing to get to, I know I noticed, but then I am the one writing (If you didn't notice, just ignore these last two sentences and imagine a beautifully concocted segue in their place; maybe something involving the classic Allen Ginsberg poem "A Supermarket in California.") is that Return Of 4Eva is better than Kanye's My Beautiful Dark Twisted Fantasy. Despite all of the applause and coddling reviews, including my own, in which I did find a lot of virtue in that album, it just wasn't as enjoyable and consistently good as Return Of 4Eva. Though, that is qualified by my lack of hip hop background, as I stated above. The thing with music, whatever the genre, is to create something that becomes desirable once you learn it. It doesn't have to be pretty. It doesn't have to be catchy, but I think "good music" relies on continued effort to make something that is both decipherable and enjoyable (once you know the code). While Kanye's album is mostly enjoyable, it seems like it's trying to be artsier than it can be. And that's fine, as long as the language the album is told in is worth learning. Big K.R.I.T. does a better job, asking for standard prerequisites and then pushing the language into political and social places that are both deeply self-referential and complex. And at no point does it seem like Return Of 4Eva it wants you to work to meet it. It takes itself seriously, but arrives casually. No absurdist costuming necessary.